Alive students line up outside on Terrell Mall. 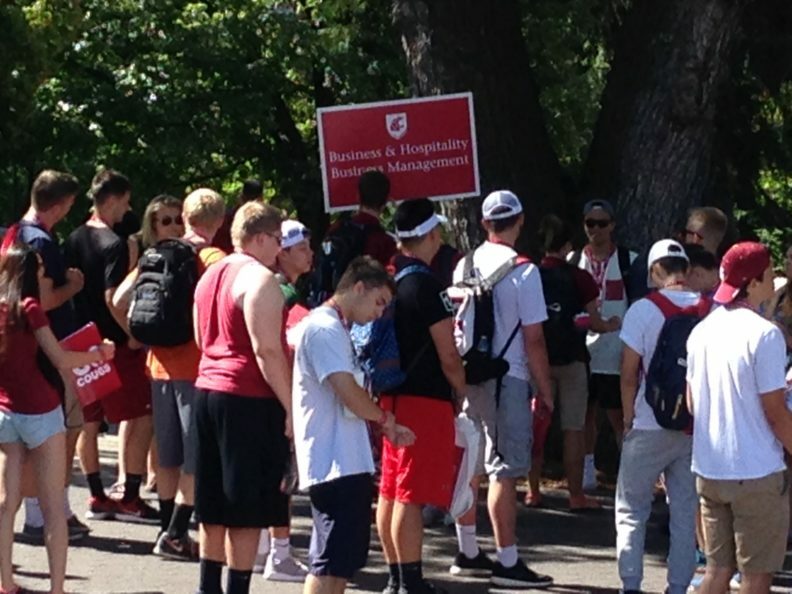 The WSU Pullman campus is anything but dead in the summer. Sidewalks team with prospective students and their parents visiting the campus. The lively music coming from the portable speakers of the program orientation counselors, who act as tour guides, creates an atmosphere of fun and excitement that is the trademark of the WSU Alive! program. The Alive! summer sessions prepare incoming freshmen, transfer students, and their parents for a successful start of the first semester by minimizing anxiety and promoting student action and responsibility. Students meet with advisors, create their course schedules, register for classes, attend academic workshops, and learn about opportunities all across campus. According to the demographics of this year’s Alive!, 61 percent of participants know they want to major in business but haven’t decided on the exact discipline yet. “That means we have a lot of work to do with them in the first two years to help them decide on a major and get them certified in their junior year,” Billington says. During the college’s Alive! 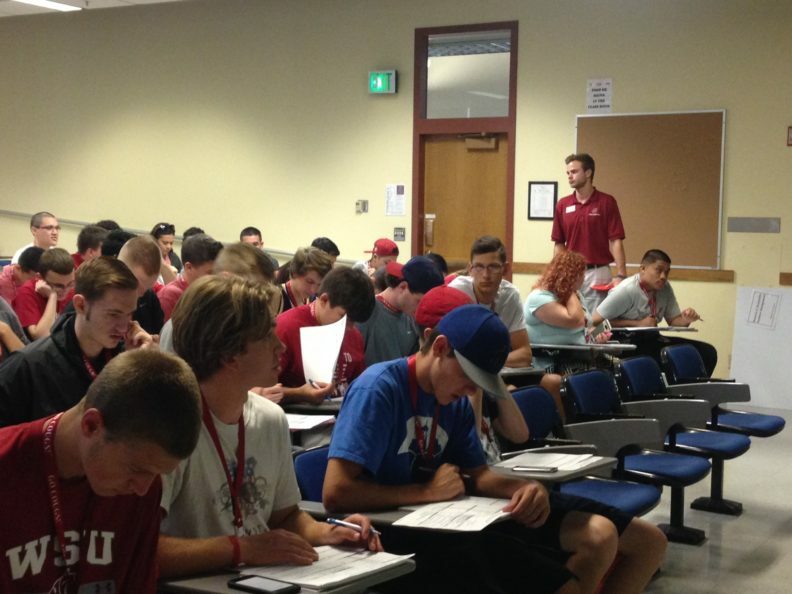 orientation workshop, Carson Center advisors welcome students to the Coug family and walk them through registration simulations and the functions of myWSU, the University’s online application and student portal. Students also receive key tips that will make their WSU experience and interaction with future professors and employers more successful. For example, if anyone has a personal email alias that is less than professional, they are advised to imagine an employer’s reaction to it and to correct it before school starts. They are also encouraged to always adopt a professional tone when composing emails and have an updated résumé on file. From the get go, Carson College students are not only encouraged but expected to engage in the opportunities available to them, such as study abroad, internships, leadership and professional development, and networking. Prospective students are often aware of the uniqueness and quality of the accredited Carson College programs even before they attend Alive! Attending the sessions and college workshop help them confirm they are making the right choice. A Carson Center for Student Success advisor helps Alive students register for classes. Jordan Graham recently attended a WSU Alive! session and learned about the Carson College. He now intends to pursue a degree in business to achieve his goal of becoming a successful entrepreneur. Miguel Carroll’s interest in hospitality business management began on a family vacation to the Ka’anapali Beach Resort on the island of Maui. The resort experience ignited a career aspiration that the Carson College will help him achieve. He attended the Alive! session and is excited to major in hospitality business management. The Carson College is adding more programs and resources to help students through the major decision-making process during their first two years at WSU. To learn more, visit the Carson Center for Student Success or contact Suzi Billington, director of the Carson Center for Student Success, at suzi.billington@wsu.edu or 509‑335‑0469. Visit us on Facebook and Twitter.